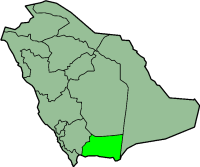 Najran (Arabic: نجران‎ Naǧrān) is a province o Saudi Arabie, locatit in the sooth o the kintra alang the border wi Yemen. It haes an aurie o 119,000 km². Its caipital is Najran. Najran is inhabitit bi the pouerful Yam tribe, who hae livit in the region for hunders o years. The Govrenor o the Najran Province haes been Mishaal bin Abdullah bin Abdul Aziz syne 2009. The umwhile Govrenor wis Mishaal bin Saud bin Abdul Aziz but he wis "relievit" in 2008.